Successfully Added 5 Inch Touchscreen Handheld GPS Navigator w/FM Transmitter (4GB) to your Shopping Cart. This glossy and smooth 5.1 inch touchscreen piece of black gold is a handheld GPS navigator and multimedia player that works any where in the world, and runs most of today’s popular GPS software around. This GPS navigator features all the powerful navigation functions you need including spoken voice directions and automatic route re-calculation that gets you back on track quickly if you make a wrong turn. This is worry-free GPS navigation at its best. In addition, you get the choice of 2D or 3D mapping that lets you find your way more easily in the busy city streets or open countryside. This GPS unit comes with 4GB of flash memory, and supports multiple digital media file formats such as, MP3, WMA, WAV and AAC for music listening, along with AVI, WMV, Real Media, RMVB and WMV for watching videos. The CS28 comes with full touchscreen control, easy to read and access icons, a 3.5mm earphone plug-in and a Micro SD card slot that support up to 8GB of expanded storage capacity. The CS28 GPS navigator also supports an array of GPS softwares such as TomTom, iGo, Route66 etc, and is designed to allow the user to operate the internal feature of this GPS navigator with ease, so that you get to keep your eyes on the road with out having to constantly access the internal applications. This superb handheld multimedia GPS navigator makes an excellent resale item for your online/physical store front or eBay shop. Click "Add to Cart" today and well express ship you a sample to see for yourself what this remarkable GPS handheld unit can do. the CS28 is proudly brought to you by the leaders in factory direct wholesale electronics, Chinavasion. Can be charged via USB connection to your computer, or wall charger, Included is a car charger as well. The USB cable must be connected to the Hand held GPS unit, in order to get the FM transmitter functioning properly. How do I connect this GPS Navigator to my computer, using the MS Activsynce feature? To connect this GPS navigator to your computer using the MSActiveSynce, you need to download windows mobile device centre from the Microsoft website. Or you can just connect it as a mass storage device, and no software instalation will be needed at all. Can I listen to Music from the Micro SD card while my GPS navigation application is running? While in the GPS navigation mode, will I be able to select different music tracks? No, onece you are in the GPS mode, you cannot change music tracks, the music will be on continues play, after one song end another begins automatically. Yes you can, in the volume option within the GPS application, you can adjust the volume of both the music and GPS application voice. 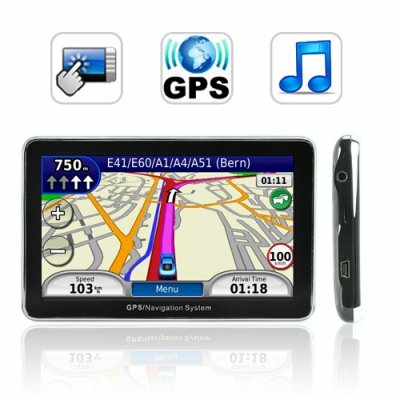 Very good product, high quality, good navigator and accepts many navi programs and maps. it worths every cent of its value. Excellent good looking product. IGO8 software, only thing i did was to change Cyprus map file with a newer one. Danke super geret !!! köszönöm egy nagyon jo navi és ezért a pénzért megéri !! !